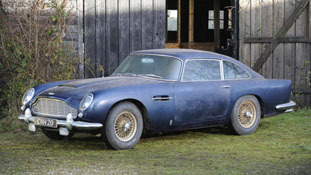 Estimated to be worth $300,000 this 1964 Aston Martin DB5 was stored in a barn in 1972 by the now deceased owner. It been untouched for the last 33 years and is a completely original DB5 with 48,000 mile on the clock. The DB5 features triple Webber side draft carbs, 4.0 liter displacement DOHC Inline-6 putting out 315 HP. The DB5 was made famous by James Bond in Goldfinger (1964) and was actually designated as the "the most famous car in the world" in 1964. This movie car was designated as Chassis Number DP/216/1 and had a very well documented history until it was stolen in 1997 and hasn’t been seen since. 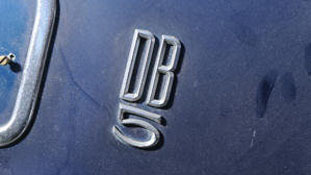 Finely restored DB5’s have brought up to $1.1 Million at auction and there are thought to be roughly 123 Convertibles (the Volante designation wasn’t used until 1965) and 65 Coupes.